The concept of Inside Out sounds unbearably twee, not to mention borrowed from the sitcom Herman’s Head. We’re seeing inside the head of a young girl, where each of her emotions is a cartoon, voiced by a comedian. But Inside Out is actually a brilliant movie about the beginning of wisdom. What follows contains minor spoilers, unless you’ve watched the trailers for this film. Then you’re good. In Inside Out, young Riley (voiced by Kaitlyn Dias) is moving to a new town, San Francisco. And we see inside her head, where her emotions struggle to adjust to this huge transition. There’s Joy (Amy Poehler), who’s sort of the ringleader of the group, plus Sadness (Phyllis Smith), Fear (Bill Hader), Disgust (Mindy Kaling) and Anger (Lewis Black). As Riley deals with a whole bunch of tough new situations, her emotions have a crisis of their own. On one level, this movie is an extended metaphor for the changes that happen in your heart and mind as you grow up — the dueling emotions show the emotional states of a child, being supplanted and rearranged as you learn maturity. But it also gets into the complexity of the ways that different emotions interact with each other. You see how emotional states are actually made up of composite emotions, or warring emotions. And the arc of this movie is not just towards maturity, but actually towards wisdom — Riley isn’t governed by her emotions at the start of the movie, but she does have a default emotional state. And her emotions have to evolve to deal with her family’s move as well as her complicated new social life. Over the course of the movie, Riley learns how to handle more challenging emotions. Or rather, Riley’s emotions learn how to manage more difficult situations, and to abandon their old assumptions about what kind of emotional state is best. The deeper you get into this movie, the more complicated the picture of Riley’s interior life becomes, until Riley’s emotional and mental world comes to seem like a real setting. Director Pete Docter (Monsters, Inc., Up) creates an internal landscape that feels vast and grand — far from the intimate, tiny story you might expect, Riley’s head is as huge and imposing as the post-apocalyptic Earth in Pixar’s Wall-E. The features of the landscape inside Riley’s head feel as though they matter. She has monuments and grand structures inside her, and the stakes in this film feel tremendous. Part of the Pixar mystique comes from that ability to make the small and intimate feel epic — the Toy Story films make traveling a mile or two feel like epic journeys, and even with the grandeur of Wall-E’s settings, it’s still a small romantic-comedy for a lot of its running time. But seldom has that paradoxical knack for making the tiny and personal feel huge been so striking. The candy-colored scheme of Riley’s interior, and the cartoony figures inside her, could easily be creepy or saccharine. But Docter, and his voice cast, infuse them with so much life and energy, they take on a kind of reality, and personality. 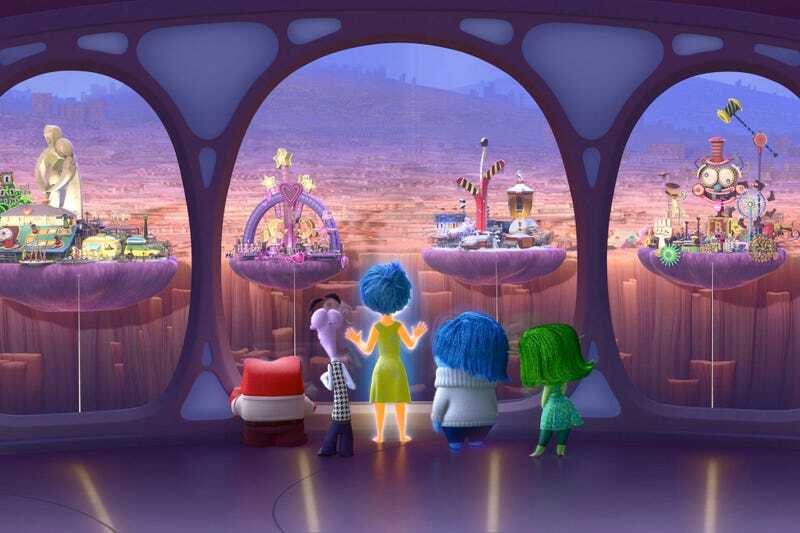 In the end, the message of Inside Out is deceptively simple. You learn a lesson about joy and sadness, and the roles they each fulfill in your emotional well-being. But meanwhile, you’ve gone on a wild, multi-faceted tour of the inside of someone’s psyche, and you’ve witnessed the emotional and psychological challenges of dealing with a variety of situations. And the way that the movie keeps coming back to the same memories, and the same ideas, infusing them with a new significance each time, is really something special as well. Plus Inside Out avoids falling into the trap of making Riley seem like she’s the only one with an inner life, while everyone else around her is a soulless automaton. If anything, Inside Out cleverly shows how much of the importance of our emotions is tied to interacting with other people, because we’re social creatures. So not just children, but adults as well, could come out of this movie smarter and with more wisdom. Inside Out has the usual Pixar knack for sucking you in and devouring your brain — and making you cry, of course — but it also has a unique ability to make you aware of your own inner life, and help you cope with the clumsy, complicated mob of emotions we all have inside us all the time. Charlie Jane Anders is the author of All The Birds in the Sky, coming 2016 from Tor Books.Follow her on Twitter, and email her.